‘Beware the Ides of March.’ So goes the fateful warning, ignored by Julius Caesar, in Shakespeare’s eponymous play. Had he chosen to stop and reflect upon it, Caesar’s life, and the course of world history, may have taken a different turn. That same message now goes to the State of Israel, its right-wing government and its supporters in the current US Administration. Beware the Ides of March. 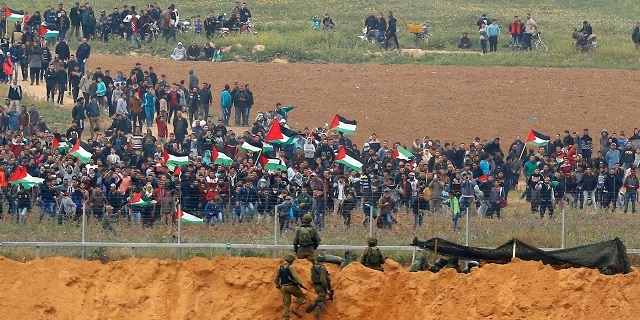 How is history going to judge those ignoring what happened at yesterday’s Great Return March in the Gaza Strip? How are we going to look back at a momentous opportunity for peace wasted by self-indulgent politicians who chose to stick to their extremism? Not only did the Israel Army maim and kill defenceless Palestinians for daring to express a basic human right — of wanting to go back home to the towns and villages from where they were kicked out for seven decades — Israel is now promoting the absurd notion that the Great Return March, in which thousands of men, women and children took part, was a ‘Hamas-organised’ ploy — that Palestinians were using their own children as “human shields”. In addition to killing and maiming us, Israel is denying that we Palestinians can act and think for ourselves. This is not only preposterous but offensive. Let us just pause there for a few seconds, and consider the notion any kind of propaganda would convince a mother to take her child to the firing line. As you put your own children to bed, reading them a story or two; as you wake up and prepare breakfast for your loved little ones, please take a moment and think of how insulting and obscene this Israeli propaganda line actually is. No amount of propaganda in the world, no matter how sinister or ingenious, could make tens of thousands of people walk willingly towards the border of their open-air prison, in full knowledge thousands of ruthless soldiers awaited them on the other side, willing to pull the trigger at any minute. Only one thing can make people do this: Desperation, the feeling that you have nothing left to lose. And this is precisely what life in Gaza — after decades of occupation and blockades — represents today: Hell itself. And yet, once again, the Israel army, and the world media, have chosen to ignore this simple, inescapable fact. Why would journalists at the New York Times care about the basic realities of life in Gaza? About the fact that electricity, water and food supplies are scarce or non-existent? About the fact two million people are trapped in an open air prison? About the fact that I haven’t seen my family for the last five years because the borders are constantly shut? About the fact that my four-year-old daughter constantly asks me whether I ever had parents, because she never saw them? Why would anyone care about that? To them we are sub-humans. It is, of course, typical of the coloniser to do this. From Gandhi’s Great Salt March to Martin Luther King’s march on Washington, we’ve all been called the ignorant barbarians who are trying to destabilise the status quo of freedom and democracy. We are “deceived” and motivated by some evil agenda that is threatening innocent people’s lives – those people on the other side of the line enforced by a system of segregation. But history will march on, and those who stand against the freedom of people will be thrown to the wayside. 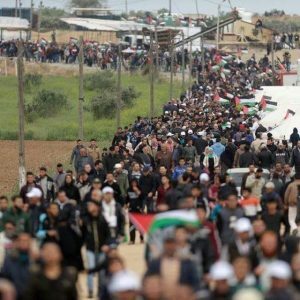 Yesterday in Palestine, a peaceful March was organised, one which insisted on its peacefulness right from the start, and did not include any political party or faction. This did not stop Israel’s soldiers from mowing the men and children down in cold blood. This act of systemic and deliberate murder was described in many of the world media outlets as ‘clashes’, implying two equal sides sharing equal blame. This is the easiest and cheapest way to demonise people; a way also not to examine the sources of their plight, and the realities of their suffering: The reality that it has been 70 years since those people were made refugees, as the State of Israel was established, an apartheid regime that has spent decades segregated the indigenous Palestinian population, deporting people stripping them of their rights to their homes, and most importantly, denigrating those who dare ask to be granted the same basic rights as everyone else. Today there are 12 million Palestinian refugees living outside their ancestral land — most in difficult and inhuman conditions across the West Bank, Syria, Lebanon, Jordan and other places around the world. They are watching intently what is happening at the moment. 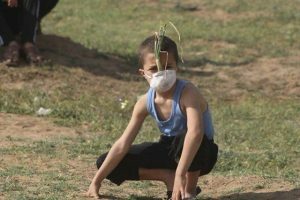 They admire Gaza’s creative and brave responses to decades of suffering and injustice and, one day, they too may follow suit. When that day comes, no occupying army, no matter how powerful or ruthless, will be able to stop them going home. Israel, like Caesar, should beware the Ides of March.